The collision of art-rock, classic pop and indie has never sounded as lush as it does on ‘Masochist’, the first single lifted from Brisbane six piece band The John Steel Singers‘ forthcoming debut album. Recorded under the guidance of producer, mentor and fellow Queenslander Robert Forster of The Go-Betweens, new single ‘Masochist’ sees The John Steel Singers blend rich vocal harmonies and horns to create a woozy, psychedelic soundtrack for the lyrics of writer Scott Bromiley. ‘Masochist’ has The John Steel Singers apply what is becoming their trademarked psychedelic, observation of a disfunctional relationship; the story here of a man who can’t apply himself to love. The band keep things upbeat though, moving between Beatles’eque horn arrangements and orchestral pomp. It’s a fluid, appealing sound. Pony Up return to Australia to promote their new album Stay Gold! Laura Wills, Lisa Smith, Lindsay Wills and Sarah Moundoukas are Pony Up – or the Ponies as their friends often refer to them. The Montreal-based quartet formed on New Year’s Eve 2002 and upon developing a relationship with singer Ben Lee, released their debut, self-titled EP in 2005. 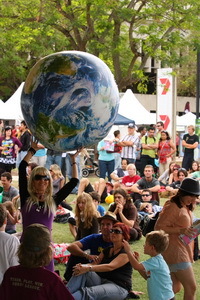 Greenfest is part of the UNEP Climate Neutral Network, a recognized Art for the Environment event and in 2009 is part of the Brisbane 150 and Queensland 150 celebrations. It uniquely promotes the best of emerging music talent with some established masters amidst a sea of fresh energy and ideas. 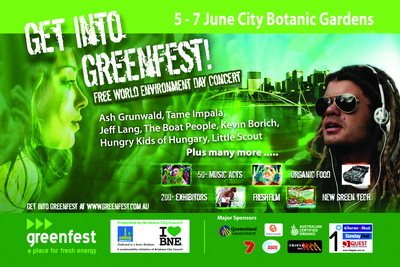 With over 50 acts on three stages, speakers, organic food, fashion, green-tech cars and 200 exhibitors, become the change you want on World Environment Day and the long weekend at Greenfest. Greenfest is free for all areas and times. If you want to support emerging local talent and fresh energy for your planet, spread the word that participation counts and show your passion for the future at Greenfest. Ash Grunwald, Jeff Lang, Tame Impala, The Boat People, Little Scout, Kevin Borich, Hungry Kids Of Hungary, Botanics, The Rocketsmiths, Mason Rack Band, Marshall & the Fro, Ange Takats, Tim Loydell & the Deckchairs, Mr Laneous & the Family Yah, Pear & the Awkward Orchestra, Banawuran, Golden Sound, 8 Ball Aitken, Trouble Karma Flow, Rachael Brady, The Reversals, Jason Lowe, Georgia Potter, Bunna Lawrie, Mark Easton, Jimmy Watts, Kim Churchill, Autumn Sun, Tom Richardson, Glass Towers and more!